A billing event is a collection of charges marked as completed and ready to be billed. Creating a billing event allows core administrators the opportunity to review charges, update payment information for charges, and determine what charges they are ready to process. 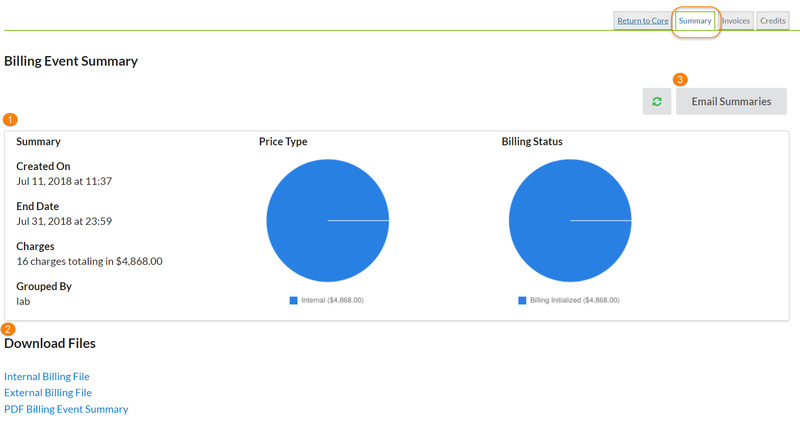 To create a new billing event, navigate to the Billing tab of your core. Click the "New Billing Event" button. The Create a New Billing Event screen displays. You will have three steps to complete. Step 1: Define which charges should be included in this billing event by adjusting the parameters, then click "Load Charges". End Date: All charges confirmed or completed on or before this date will be searched for. Event Name: Designate a name for this billing event. By default, the system will append the current month to the name of the core. Include: Filter for internal charges or external charges. The default is "all". Group By: Set how charges should be grouped when creating invoices. You can group by Lab, Researcher, Request ID, or Payment Info. By default, invoices are grouped by lab. Once parameters have been defined, click on the "Load Charges" button. All the charges within the defined parameters will display. Step 2: Designate which charges will be included and which will excluded (if any). By default, all eligible charges are included. To exclude a charge, click on the green down arrow beside the charge. It will move to the excluded charges section. To include a charge that was previously excluded, click on the green up arrow. Similarly, the charge will display in the included charges section. Step 3: Choose whether you would like to create the billing event, save the billing event as a draft, or cancel the billing event. If you select to create the billing event, your new billing event will now display on the Billing tab in the list of billing events. You will be able to view the Summary of the billing event or the Invoices from the ‍links listed. Saving billing events as a draft provides a core the flexibility to review and organize charges over the course of their billing cycle without committing charges to an invoice. This can be helpful for higher volume cores, or facilities that have longer billing cycles, or in cases where Institution Administration handles customer invoicing. Additionally, it gives institution administrators the ability to review charges before invoices are generated. To create a draft event follow Step 1 to Step 3 above and select "Save as Draft" under Step 3 on the New Billing Event page. The screen returns you to the Billing tab, where you can view the summary or edit the charges in your new draft billing event. When a draft billing event is created, a summary of your charges included in this event are visible from the "Summary" link. You can also continue to add charges to the billing event using the Edit link. From the edit link, you will be directed to the Edit Draft tab or you can navigate to the Edit Draft tab from the Summary link. From the Edit Draft tab, you have the option to edit and/or add charges. Step 1: From the "Load Additional Charges" button, you can set new parameters to include additional charges to this draft billing event. Step 2: You will able to review and update payment for charges. You also have the green action arrow icons that will allow you to add or excluded charges from the draft. Step 3: Save this event as a draft again by clicking "Update Draft", "Create the Billing File and Invoices", "Delete Draft", or "Cancel" your changes but retain the previous version. At times, core administrators have created multiple Draft billing events that need to be merged into one final billing event. On the Billing Tab, navigate to the Merge Drafts button. Only billing events from the same core with the same charge grouping on invoices can be merged. Select the events to combine and click 'Merge Drafts' button. The summary tab gives an overview of the charges that are included in the billing event. The summary tab also allows for the core administrator to send or download their billing file, and email institution administrators a PDF of the summary page. Summary of Charges: This section outlines high level information about the charges included in the billing event. Download Files: The core facility can download billing files. Note: For institutions with integrations, there will also be a button to send the billing file to the institution billing system. File format may differ with integrations. Email Summaries: Send an email to institution administrators with the summary information included.